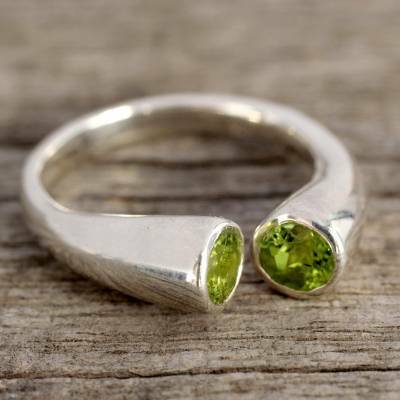 Handcrafted Jewelry Silver and Peridot Wrap Ring from India, "Face to Face"
Forming a circle like endless love, peridot stones reach toward each other in a verdant gaze. Alok Jain presents them in sterling silver for an original and beautiful ring. The gems total 1.5 carats. Ring front dimensions: 0.4 cm H x 0.6 cm Diam. Ring front dimensions: 0.2" H x 0.2" Diam. You can find peridot wrap ring 'Face to Face' by Alok Jain in jewelry categories such as Modern Rings, Birthstone Rings, Peridot Rings, Silver Rings, Sterling Silver Rings and Wrap Rings. Enjoy exploring these sections for other Novica treasures. "Just distinctive enough to meet my standards." I wear a lot of silver and am super particular about what I add to my mix. Size was accurate. A great purchase. I received this piece yesterday and can't take it off. It is so comfortable and beautiful. Well constructed with exquisite quality. Thank you for the care that went into making it. It will be very cherished. I am blessed to receive it. This is a beautiful, classic looking ring. I wear it all the time and love to just admire it. This is a beautiful quality ring. I love it!